As an eighteen year old girl, Nazneen is given in marriage to a man she has never met. Her husband, Chanu, takes her from her home in Bangladesh to London. Since childhood, Nazneen has been reminded that she was left to her fate as a baby and should continue to do so. So she tries to make the best of her situation, listening to each of her husband's impossible schemes, raising their children, and tending to their increasingly cluttered apartment. But tensions are rising in London between immigrants and long time residents. As things begin to change around her, will Nazneen finally change as well? This is a good novel. It brings up a lot of interesting questions. Can immigrants become a part of a new community or will they always be outsiders? How can women overcome their oppressive upbringings? Can we ever truly leave our pasts behind? While it was a thought-provoking read, it ultimately suffered from two major problems. The first problem is that no book could ever live up to the amount of hype that surrounds this novel. The edition that I read exclaims on the front cover that it was shortlisted for the Man Booker prize and then opens to four pages of ecstatic blurbs from every publication in London and the US. As I read, I had one of those moments where I wondered if I was reading the same book that they all gushed so enthusiastically about. The second problem is the length. The reader knows just from looking at the back cover that Nazneen is going to go through some change. We know that she will begin an affair with a younger man who is involved in the uprisings. But it takes an incredibly long time to get there. Karim, the man in question, does not show up for 200 pages. Brick Lane is very repetitive. I have to imagine that this is a conscious decision on Ali's part, that she gives the husband so many schemes and ways to berate his wife in order to show the painful monotony of her days. In spite of all of these pages, I never felt connected to the characters. Part of that may be their cultural upbringing - Nazneen is told to let fate do what it will. But those circumstances don't make for captivating reading. While I'm talking about the things that bothered me, there was one smaller bit that drove me crazy. Nazneen often gets letters from her sister Hasina who lives back in Bangladesh. Her life is very different from Nazneen's and the relationship between the sisters is one of the most interesting parts of the story. We know that Nazneen speaks very little English, so we can only assume that her sister writes to her in her native tongue. For some reason, Ali chooses to represent Hasina's writing in Bengali as extremely mangled English. This was an irritating and confusing choice. 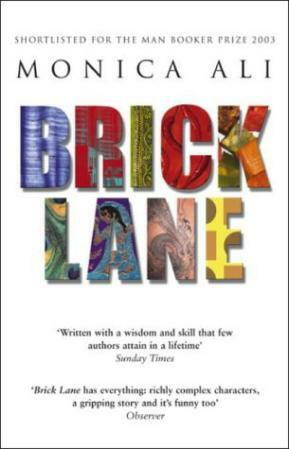 Brick Lane is a very long book where not much happens. It is not a terrible book - it will give you some insight into the lives of immigrants in modern times and the struggles between a traditional upbringing and a modern world. I wish it had been a shorter book with characters who do more and evolve more. As it stands, it was a disappointing experience for me. Hmm.. it sounds like it was an interesting plot but didn't do much delivering. It reminds me of a nonfiction title I read for a history course that I can't, for the life of me, remember. It essentially followed the same lines, except it was a Nigerian woman brought to London by her abusive spouse. It was very sad and really hard to read about someone that couldn't change her situation no matter which way she turned. And very weird that the Ali decided to include the broken English in the letters present. Perhaps it was there to add more authenticity and her sister was learning? Or that's my thinking anyway. Sorry you didn't enjoy it. It was hard to read and perhaps the most difficult thing was that she didn't really seem to want to change her situation. When things finally do happen, they seem to happen to Nazneen instead of her making them happen.